‘Jack of all trades, master of none’. This adage has long been said, accepted and followed by all of us. This derogatory saying is used in reference to a person having multiple interests but not being an expert in anything. For us, its implied meaning has been to focus on one field and be specialist in it rather than trying everything and being amateur. If a person limits his interests, he limits his life. A jack of all trades is a multitalented person. His brain has more grasping power. Studies have proven that whenever you try to learn a new thing you actually challenge your brain and help it to stimulate. So, the routine task may prove fatal to the brain. He will try to get hold of every opportunity which comes his way, because he is not afraid to learn new things. His adaptability makes him more experienced. Variety is the spice of life and thus a person with multiple interests and capabilities will live his life to the fullest. In our education system too there are many examples which prove that even being master of one does not help. An engineering student wants to study economics. After getting a degree in engineering , the students do their masters. Even the corporate culture wants variety. In an interview, the candidate is asked questions about sports and various other topics. Candidates having certificates in co-curricular activities are given priority. So, basically I was in the opinion that this adage has come of age and looking at the present scenario, the time has come to ignore what other people refer you as. But little did I know that we have been misquoting the phrase all the while. The original phrase has been moulded multiple times. 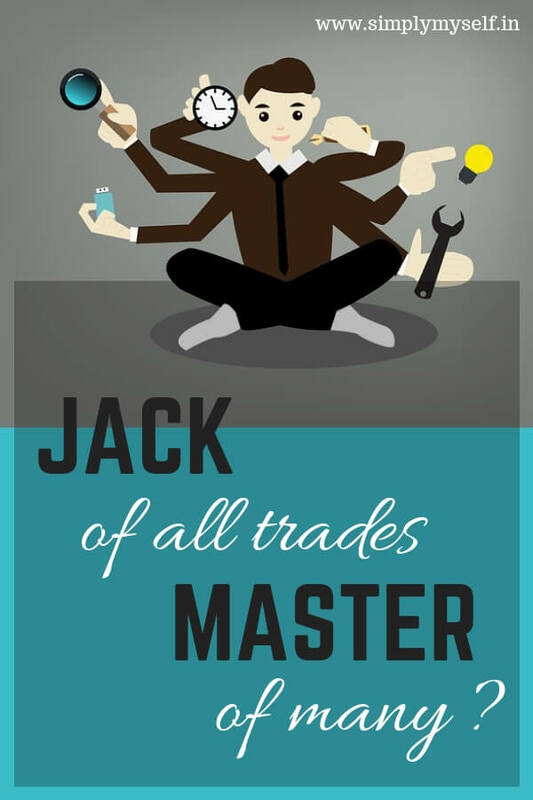 In the 16th century the term ‘Jack of all trades’ was first mentioned with a purely positive essence. It was used to praise a person having multiple interests and expansive knowledge . Later, the phrase ‘master of none’ was added to it which changed its intent altogether. Then it was shaped again with the appendage ‘But oftentimes better than a master of one’. Now, this makes a perfect sense to me. A person with a wide range of skills in his hold, always has the ability to be master of some which is significantly advantageous than being mastered in one. Moreover, we should not forget that an adage or a quote can not completely define a human and the magnitude of his capabilities. After all, this too has been innovated by a human mind enveloped in certain circumstances. Then why should a generalist try to mask the diversity of his experience just to assume an image of specialization? Isn’t it better to showcase ourselves ,as our real self? Whether a jack or a Jill, feel confident and own being what you are. Follow your passion(s). Give wings to your dreams. Sky is the limit and we have only one life. I totally agree! “Jack of all trades” is also like a “Renaissance Man” which also has a positive connotation. My boyfriend would definitely fall into this category. He is skilled in film, music, art, fashion, and cooking. Although I just have one main skill and passion — writing — I do many things under this umbrella. I write experimental short stories, sales articles, personal development blog posts, and am currently working on a horror novel!